Clooney's Nobu Lee photo credit Anna Kidman. Auckland diners are in for a treat with a special trans-Tasman chef collaboration taking place at three hatted fine dining restaurant, Clooney in May. For one evening only, on Thursday May 9, Clooney head chef Nobu Lee will join forces with Daniel Puskas, the head chef and co-owner of Sydney restaurant Sixpenny, to create a memorable seven-course tasting menu. With the menu’s focus on New Zealand’s seafood, both chefs will spend two days prior the dinner at sea in the deep south of the South Island, gathering kaimoana for the event before returning to the kitchen to create a memorable menu with their bounty. Chef Lee joined the Clooney team more than a year ago and is recognised as one of Asia Pacific’s top chefs with an impressive resume of Head Chef roles at award-winning restaurants including Marque in Sydney and Vue de Monde in Melbourne. 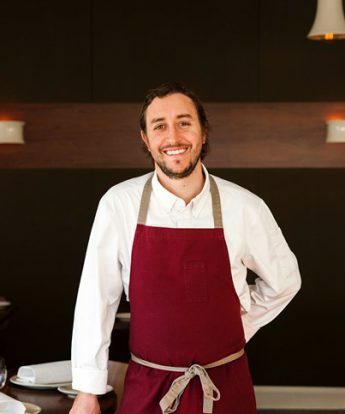 Chef Puskas has a string of creds to his name including the coveted Sydney Morning Herald Citi Chef of the Year 2018, now a national award, while late last year Sixpenny gained 3 chefs hats in the Sydney Morning Herald Good Food Guide 2019, two stars in Gourmet Traveller and in the last three years the restaurant has been listed in the top 10 restaurants for Australian Financial Review’s Australia’s Top 100. Clooney’s owner and manager Tony Stewart says this collaboration will be a celebration of local cuisine. He adds that while he’s always wanted to hold a collaboration dinner with a three hatted chef, it was the philosophy of Daniel Puskas and his Sixpenny restaurant that made them the ideal partner for this event. Sixpenny is named after the sixpence restaurants that operated in Australia in the late 1800s and is a small, independent, three-hatted restaurant which has been operating since 2012. Much like Clooney, it utilises local suppliers, growers, producers and craftsmen to focus on a complete dining experience. The collaboration dinner will take place on Thursday, May 9 at Clooney.